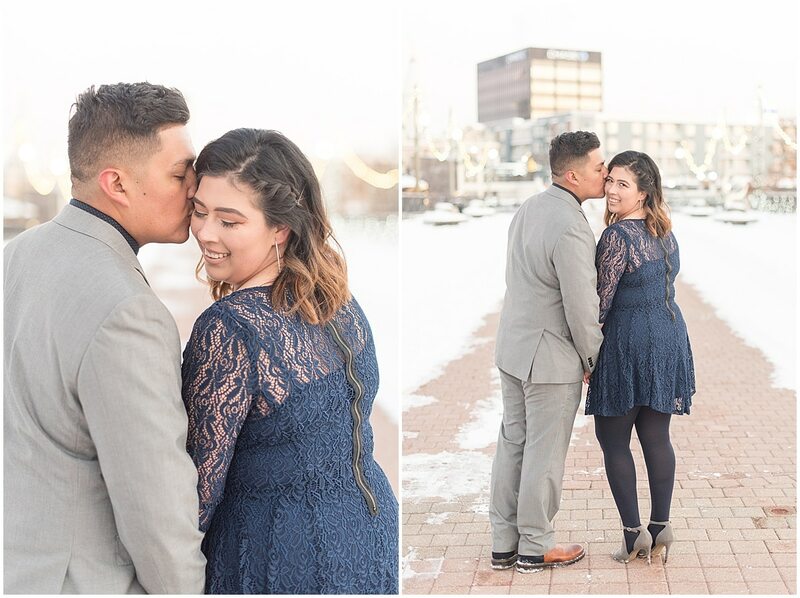 The sweetest, most darling couple? Fresh, fluffy snow? And, hot chocolate? 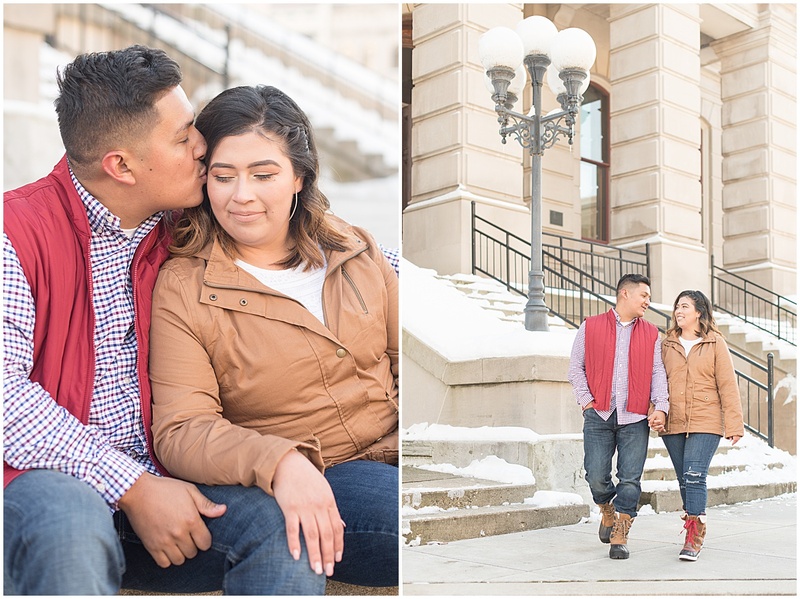 Guys, it doesn’t get anymore perfect than Jose and Carolina’s winter engagement photos in downtown Lafayette, Indiana! 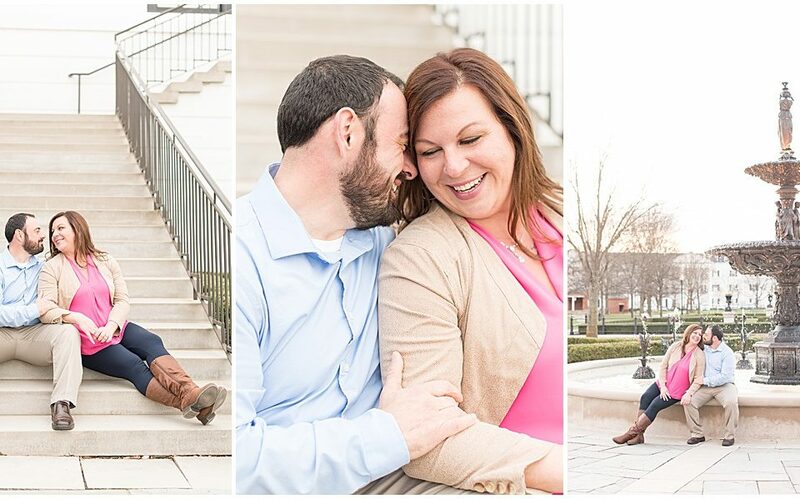 And, I’m so excited to share their session on the blog! 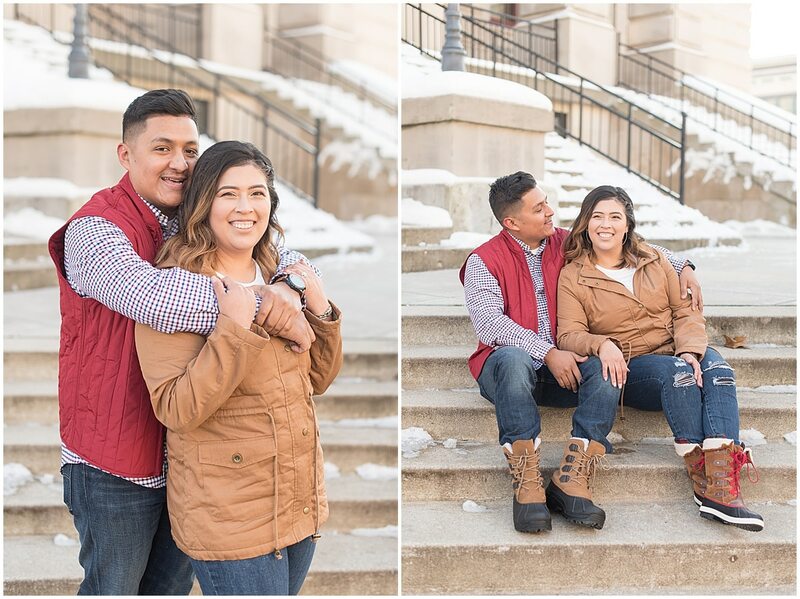 Jose & Carolina have been best friends since they were 16. 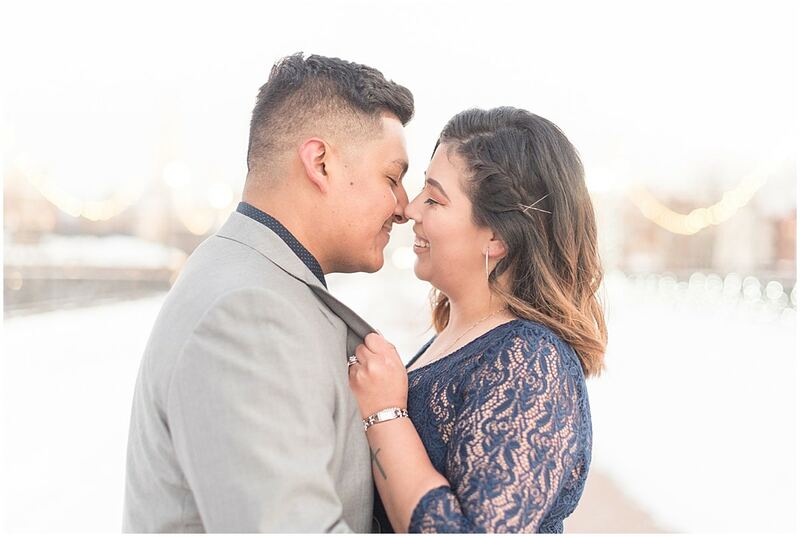 Because Zach and I met in high school and were best friends before we started dating, I have a very special place in my heart for couples with similar stories—like Jose and Carolina. It’s an incredible thing to start a relationship when friendship is your basis. 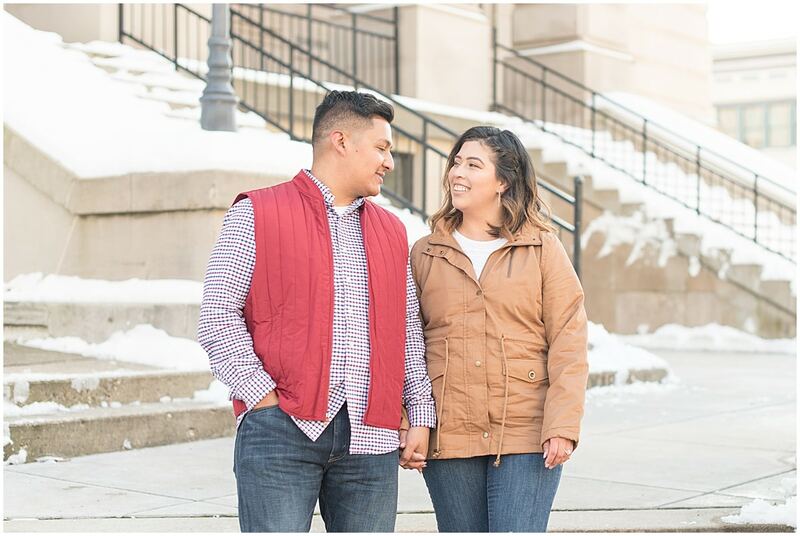 Jose and Carolina are from Frankfort, Indiana and have known each other since the second grade. 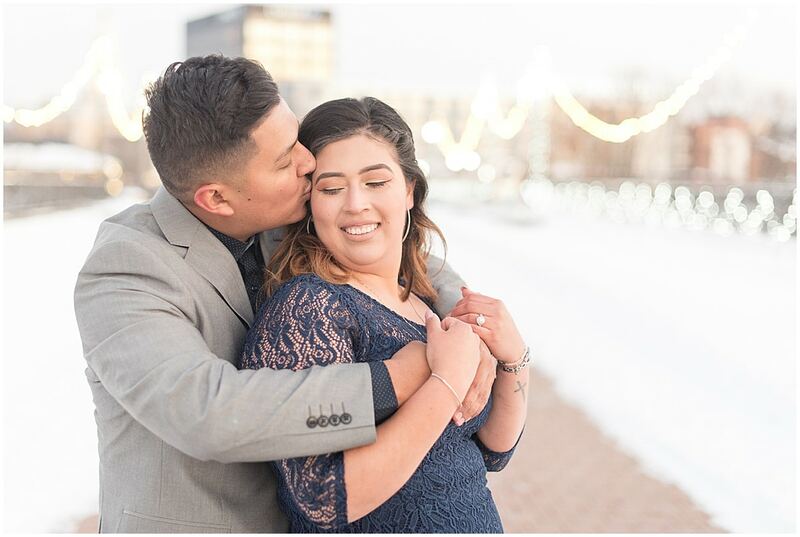 According to Jose, they became best friends when they were 16 years old. 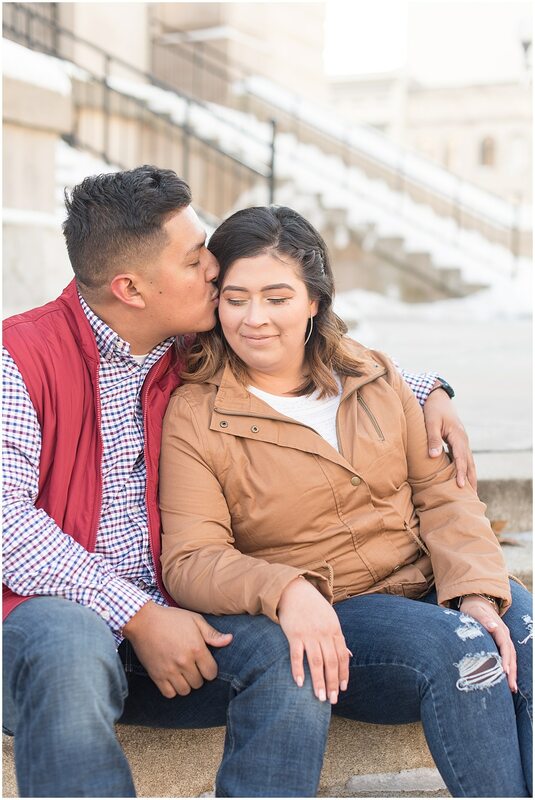 One thing led to another, and by their junior year of high school, they were officially dating! 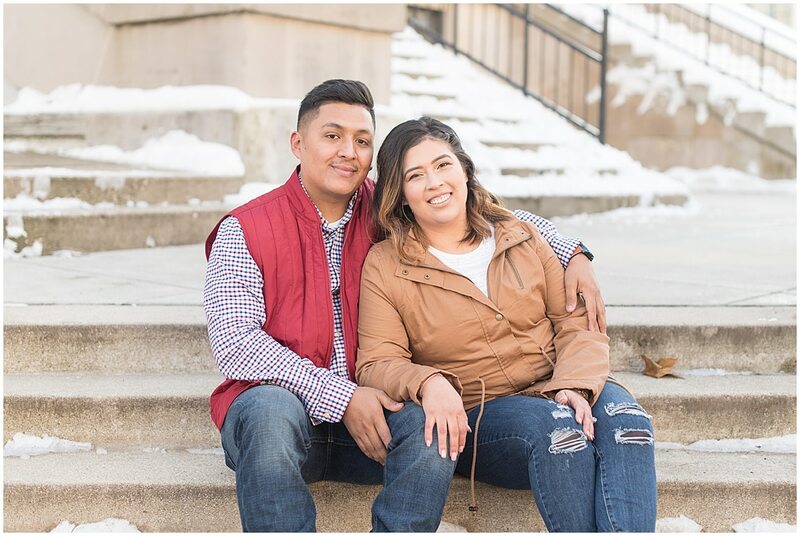 They both attended IU Kokomo, where Carolina studied nursing and Jose studied business, and stayed together through school. 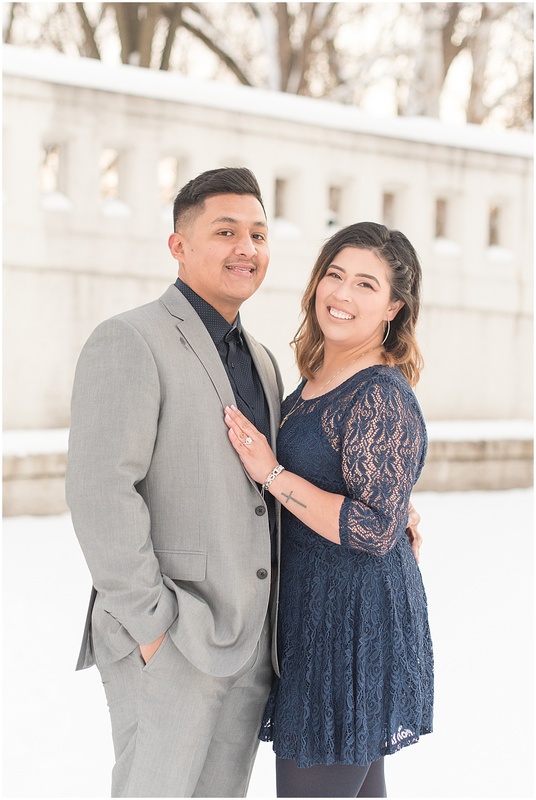 Then, on May 12, 2018 (which happened to be Nurses Day), Jose popped the question at Carolina’s uncle’s wedding so her whole family could celebrate with them. He’s such a thoughtful guy! 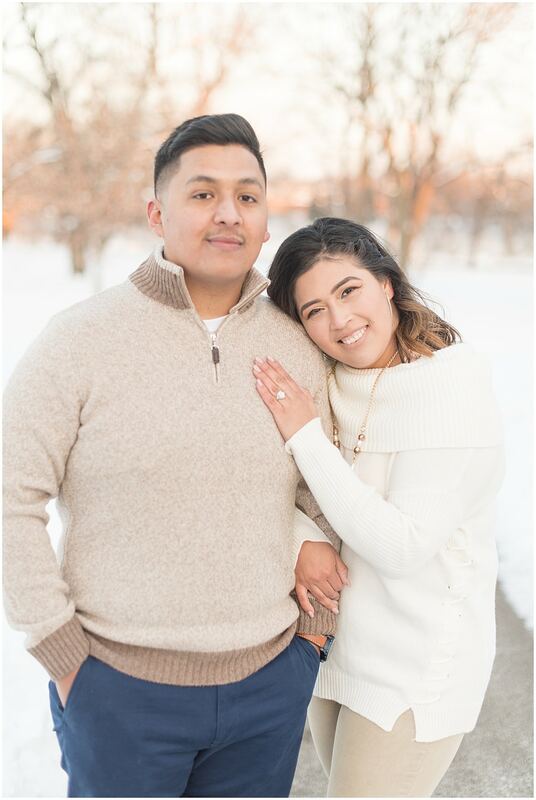 Jose and Carolina will tie the knot in November 2019. 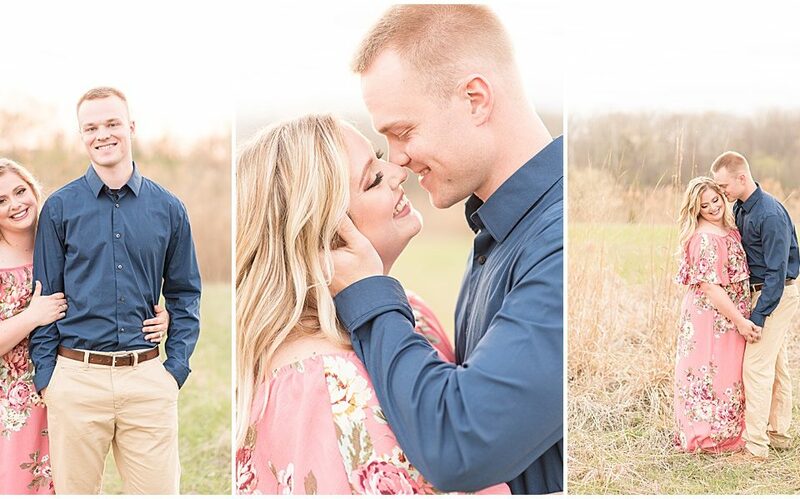 They really want to enjoy being engaged and not spend every second of this precious phase of life wedding planning. 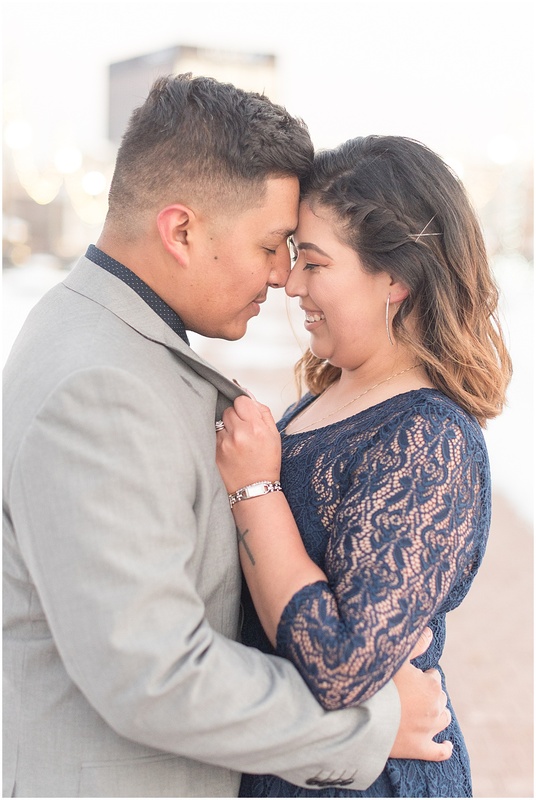 So, they did the bulk of their wedding planning not long after getting engaged and plan to spend the rest of their engagement simply enjoying each other and this phase of life. 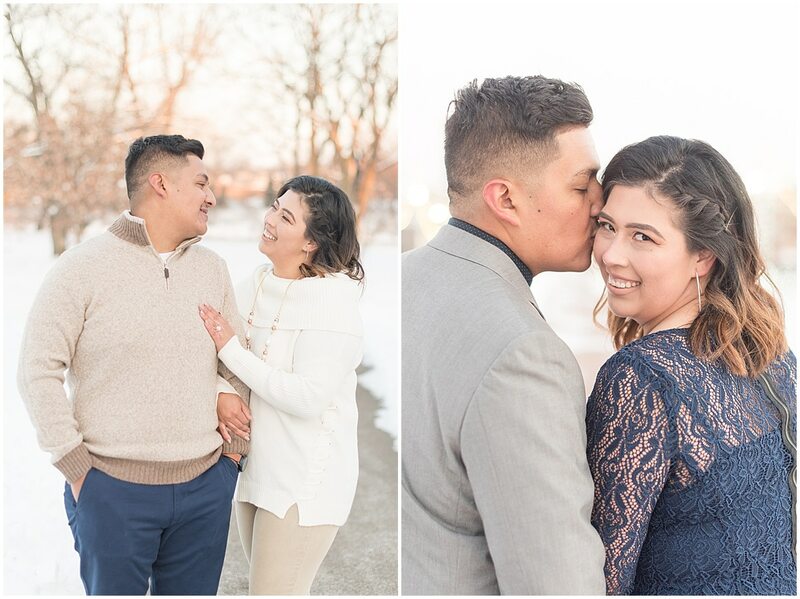 In fact, they both have family in Mexico, so they took a trip south this winter and spent time with loved ones. Then, Carolina—who worked at IU Methodist before—was hired as a travel nurse. 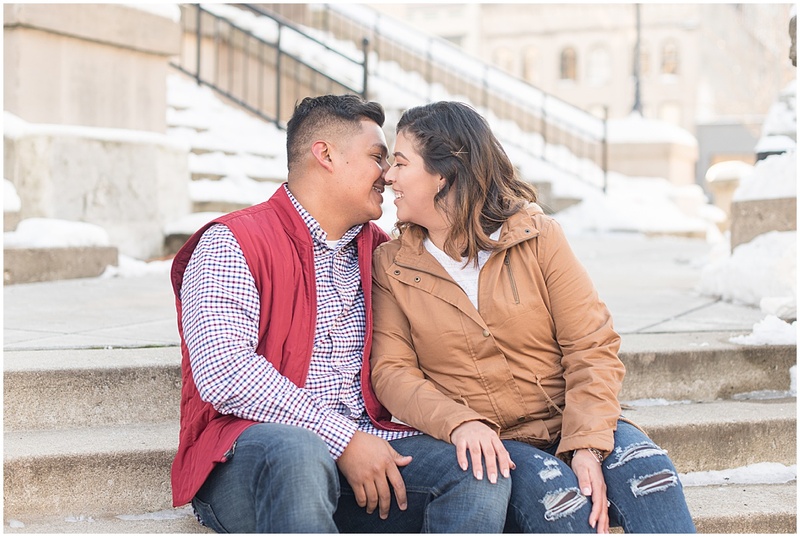 Wanting to travel and spend as much time together as possible, Jose is traveling with Carolina, and they’re so excited to see where her job takes them! 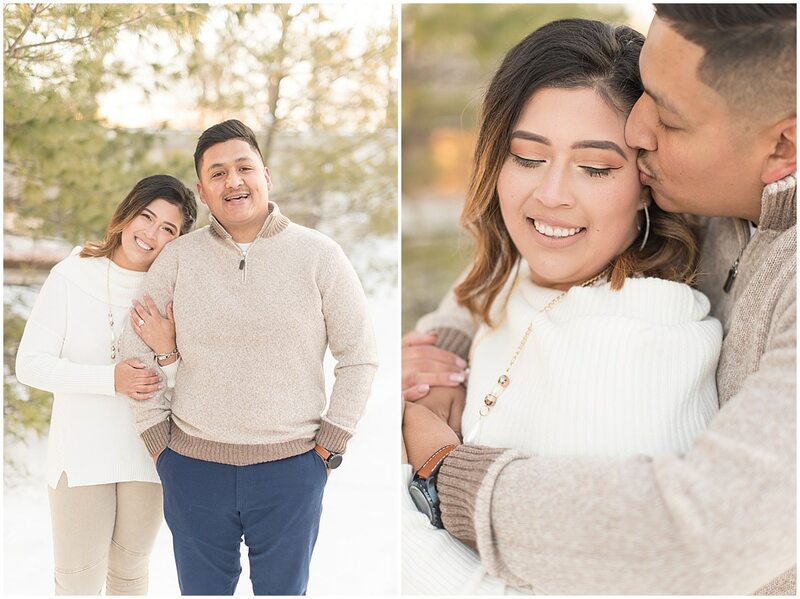 It can be easy for couples to get wrapped up in wedding planning, but I’m so glad Jose and Carolina are taking the time to soak up this phase of life. 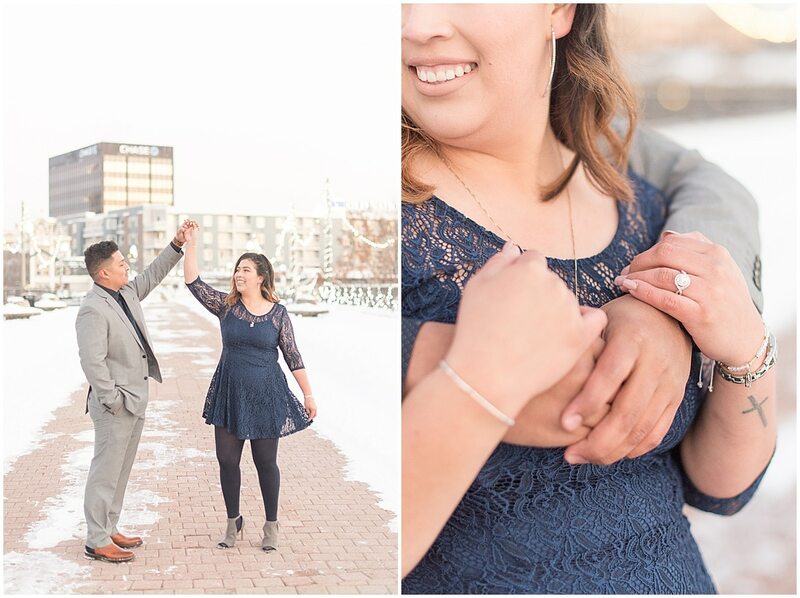 After all, they’ll only be fiancés once! 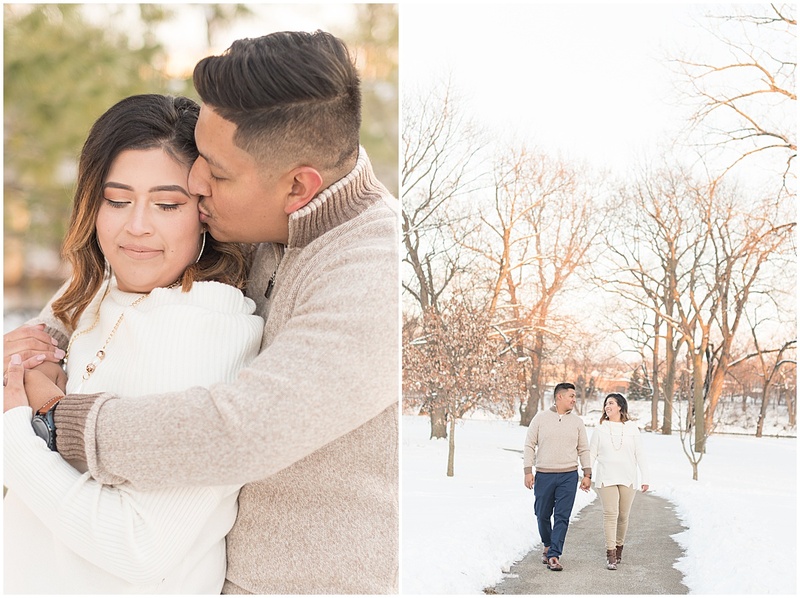 Carolina had her heart set on winter engagement photos. “We can definitely do our best to make that happen!” I told her. 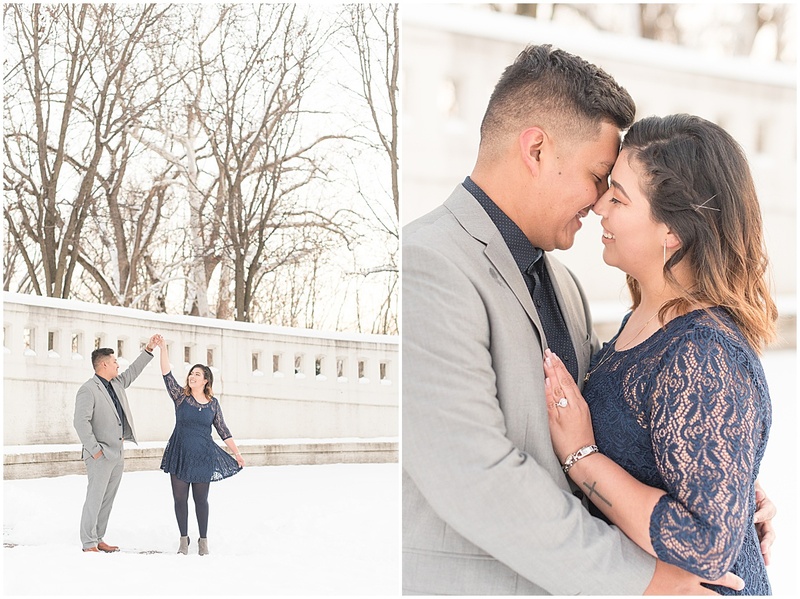 In Indiana, we only have a few pretty, snowy days a year. So, when winter came, I was constantly checking the weather hoping the perfect day would come along. Fortunately, it did! 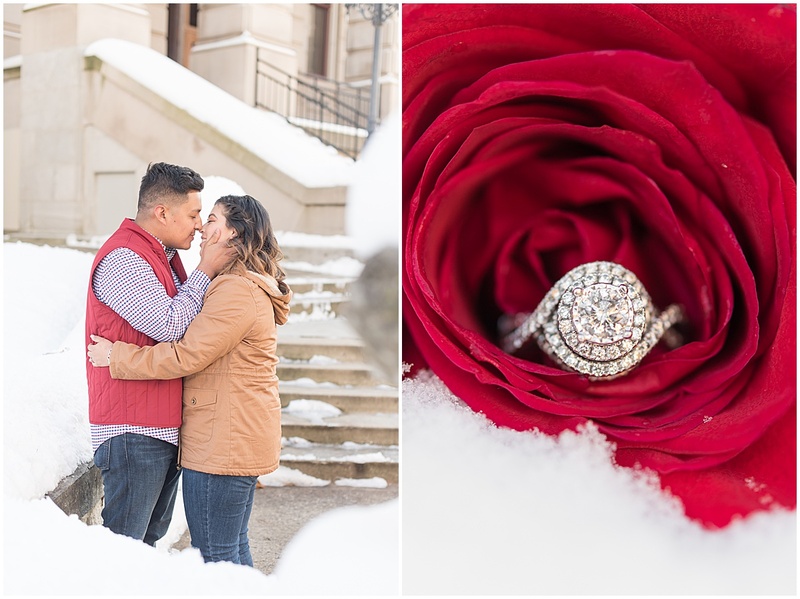 So, Carolina and Jose met up with me on a weeknight for winter engagement photos in downtown Lafayette, Indiana, and it couldn’t have been anymore perfect! 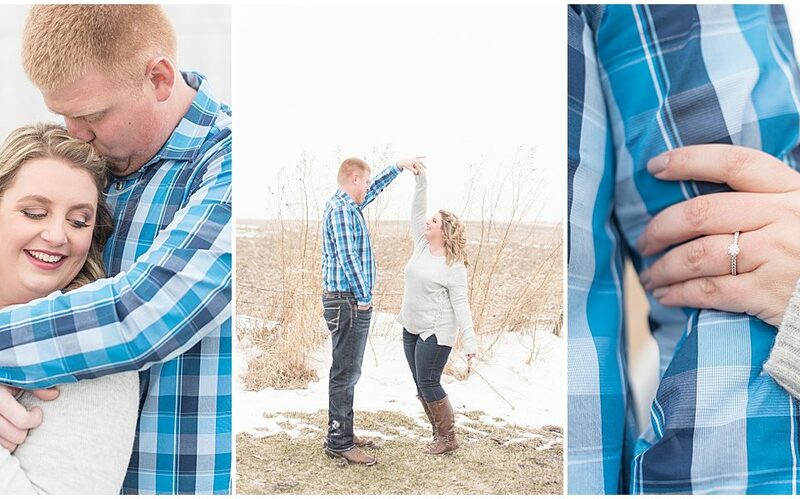 While a little chilly, these two were great sports, extra snuggly, and so much fun to hang out with. 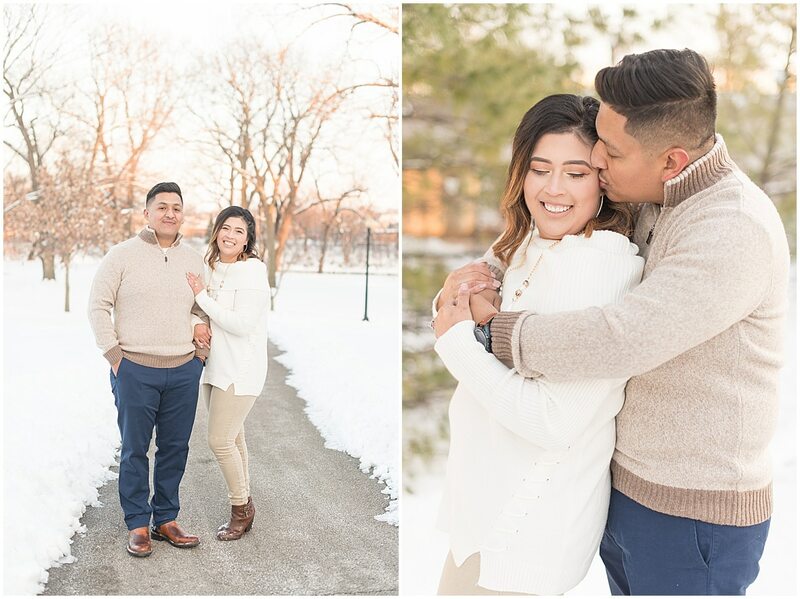 And, guys, just to give you an idea of how sweet Jose and Carolina are, they were so concerned that I was going to get cold that when they went to change into their second outfit, they got me a cup of hot chocolate from Java Roaster. 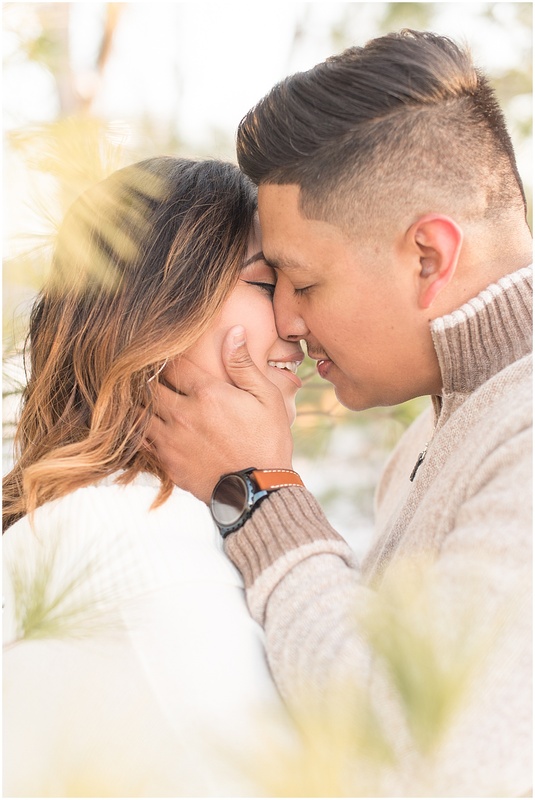 Jose & Carolina want their culture to be a big part of their celebration. 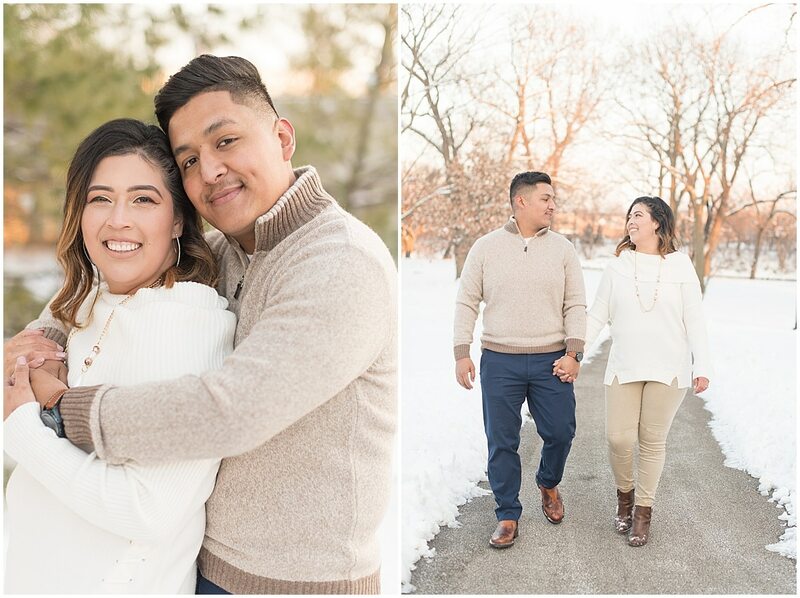 While Carolina wanted snowy engagement photos, something even more important to both her and Jose is including their hispanic heritage in their wedding. Their heritage is very important to them and something they’re fortunate to share. 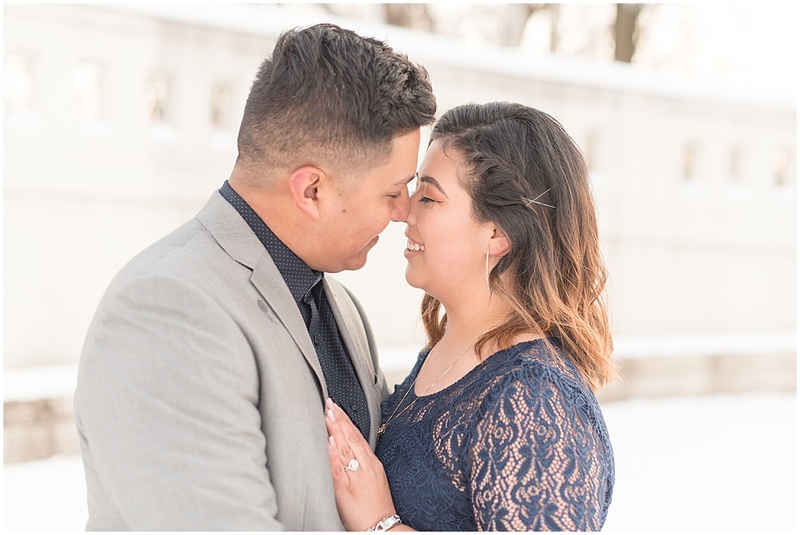 This will be my first, true hispanic wedding, and Jose and Carolina have been so sweet in filling me in on traditions and other things to expect so these special moments can be captured. 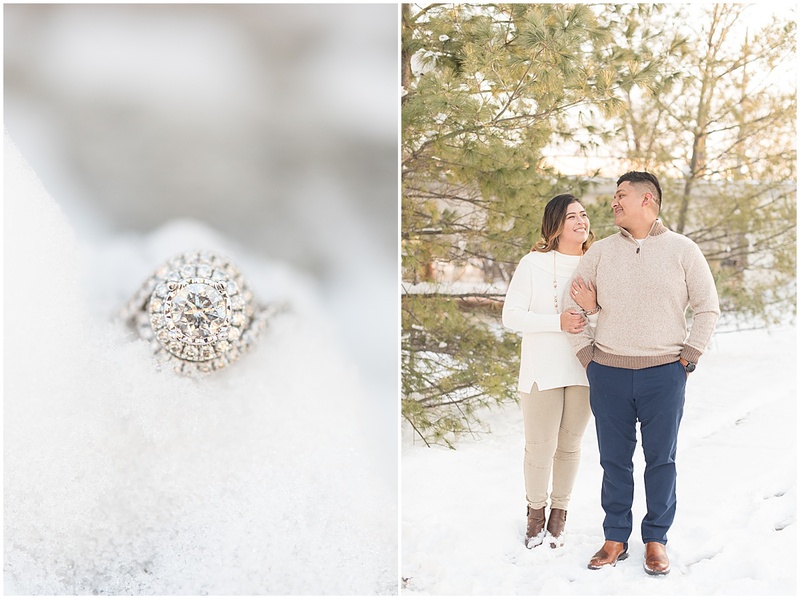 So, stay tuned for photos from their November 16, 2019 wedding, because it’s going to be incredible! 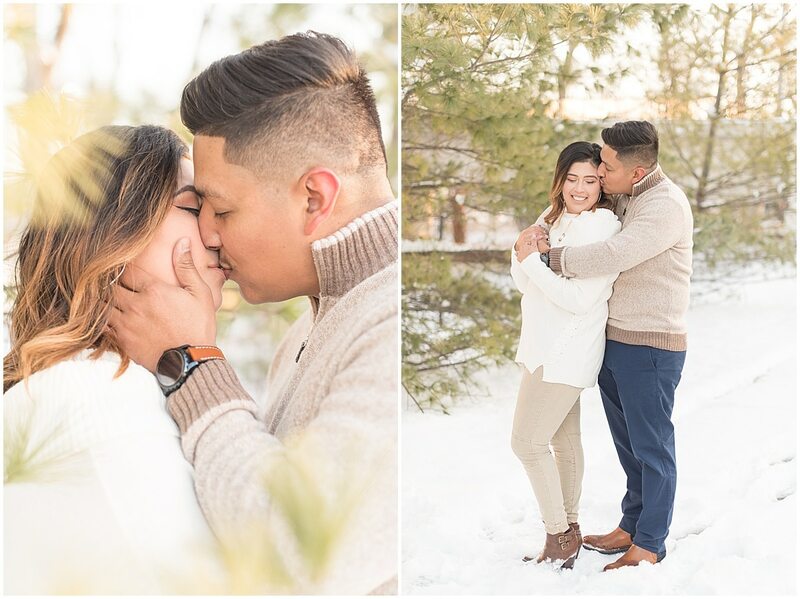 Jose and Carolina, I can’t thank you enough for trusting me to be your wedding photographer. 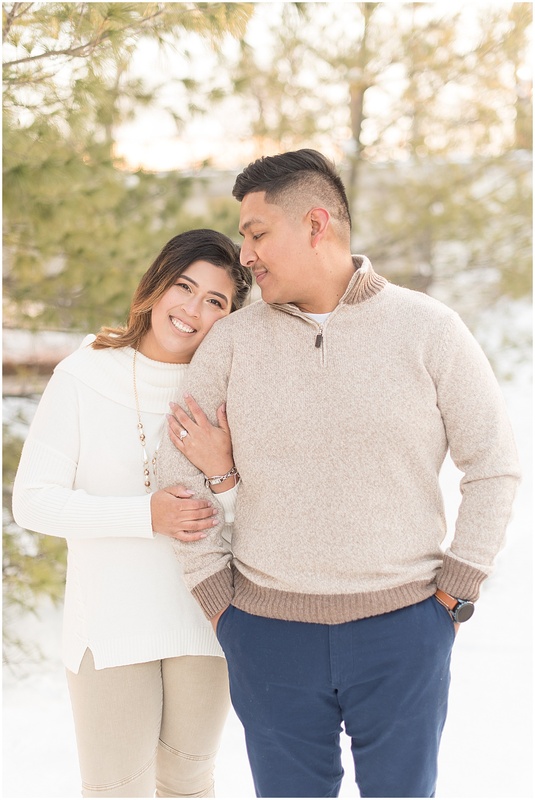 You’re both such kind-hearted people, and you make an incredible team. 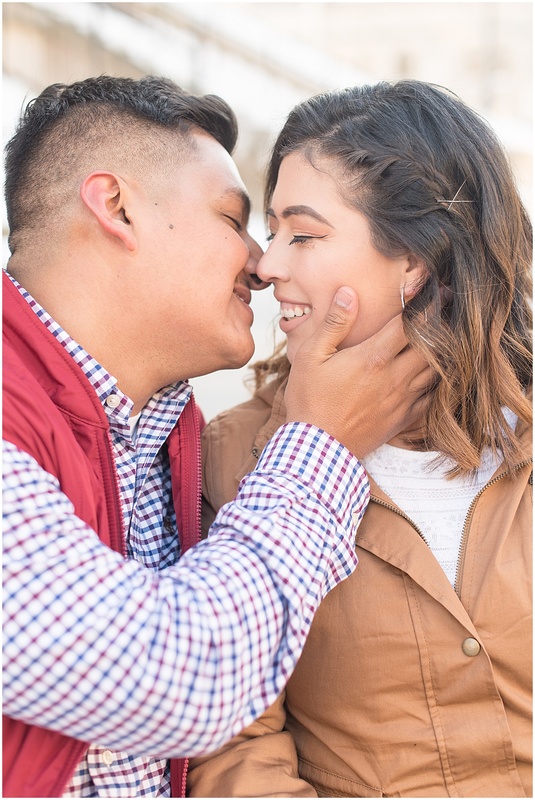 I know your wedding day will be amazing, but for now, I hope you’re enjoying every second of being engaged. 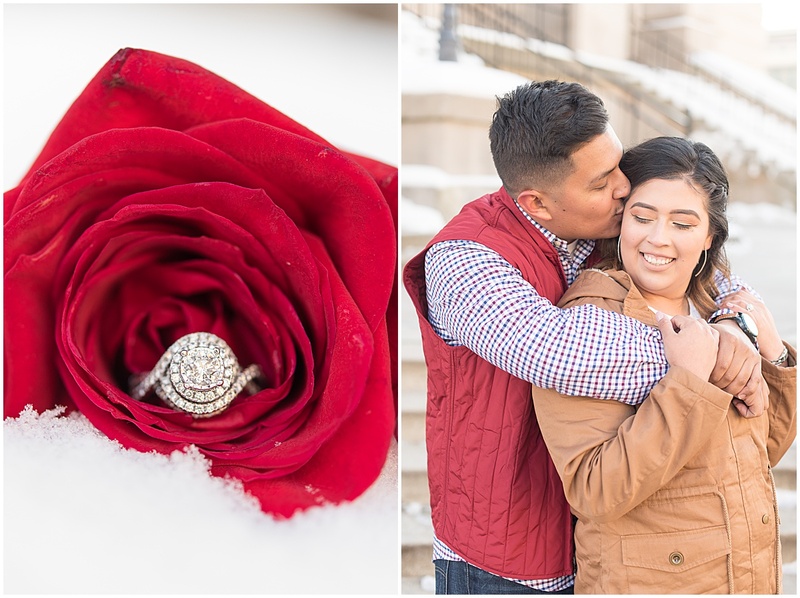 Congratulations, Jose and Carolina, and thank you for allowing me to be your photographer!